1. Drink green tea instead of sweet tea. Green tea has a natural component that helps speed up your metabolism. Skip the box tea and opt for the brew-it-yourself with boiling water and a tea-bag-type tea. 2.While enjoying the sun and outdoors, protect yourself from overexposure to sunlight by wearing a hat and using natural sunscreens without excessive chemicals. Carry Aloe Vera gel for overexposure and have an aloe plant growing in your home for any kind of burn. The cooling and healing gel inside the leaves will soothe any sunburn. It works great. 3. Don’t skip breakfast. When you wake up in the morning, your body is running on fumes. Eating a breakfast with protein, carbs, and healthy fat kicks your metabolism into high gear and provides energy for the day. 4. Enjoy summer fruits and veggies. It’s easy to sink into a vegetable rut, eating the same boring veggies week after week, but with summer comes fresh choices. Including a mix of in-season colorful veggies in your meals gives your body a nutrient kick. 5. Snack at work. Bring snacks to work and graze throughout the day. When you eat more often—five to six times per day—you’re far less likely to overeat and more likely to stay energized. 6. Grab a sports drink. For workouts lasting longer than 45 minutes, drinking a sports drink every 15 to 20 minutes can help you maintain energy, increase endurance, and stay hydrated. 7. Include some protein with one or two meals. There are a number of light, nourishing proteins that don't require cooking. Most of these complement fruits and vegetables nicely-- nuts, seeds, sprouted beans, soy products, yogurt/curd and cottage cheese. 8. 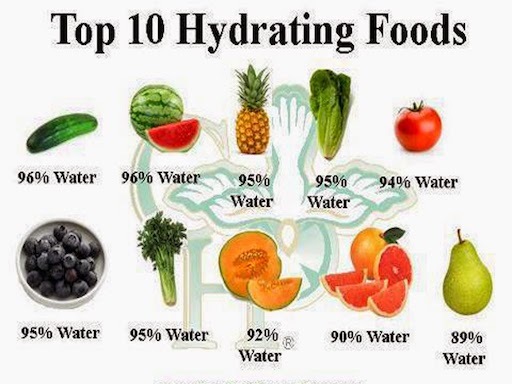 Hydrate often. The summer heat makes you more susceptible to dehydration. Start off your day by drinking two glasses of water and keep drinking at each meal, as well as before and after your workout, to stay hydrated. Carry a water bottle with you as a reminder to stay hydrated. 9. Cook meals together. Involve your friends and family in your healthy lifestyle this summer. A simple way to start: Plan meals, shop, and cook with your spouse and kids.